WordPress is a free content management system for a blog — and an online store. The popular open-source project has an active development community and an abundance of instructional tutorials to get started. Here is a list of tutorials to learn WordPress. There are tutorials to get started quickly, comprehensive guides to master WordPress, and articles on specific topics, such as customization, theme development, and ecommerce plugins. WordPress Lessons. The best place to start for instruction on WordPress is WordPress.org. WordPress Lessons has a large library of tutorials, including lessons under WordPress for Beginners, designing your WordPress site, theme development, and website development. WordPress eCommerce: Problems, Plugins, and Solutions. This series from Tuts+ covers the problems and challenges that you may face when developing a WordPress ecommerce site, such as evaluating your business for a WordPress ecommerce solution, choosing the right theme for your website, and using solutions to address WordPress ecommerce challenges. Follow all of the Tuts+ tutorials under the WordPress category. Ultimate 12-Month Guide to Learning WordPress (Plus Resources). From Hongkiat.com, this is a 12-month guide to master WordPress, one topic per month, one month at a time. Each month includes a full list of resources that will take you from getting started to advanced development tools. WordPress How-To For Beginners. This tutorial series from SiteGround provides detailed instructions on how to use WordPress to create and manage your site. For both simple and complex websites, it covers the basics and a few advanced topics. 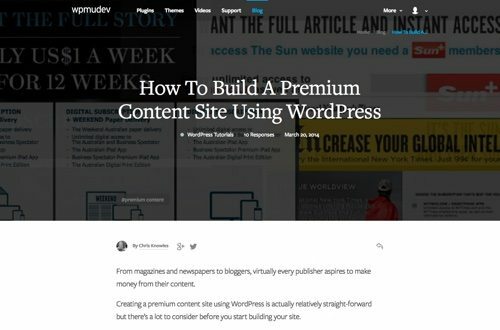 How To Build A Premium Content Site Using WordPress. This tutorial from the WPMU DEV bloglooks at how to approach creating and maintaining a premium content site, including potential technical implementations. A Beginner’s Guide To Customizing A WordPress Site. If you’re new to WordPress, the thought of tinkering with its code can be a daunting one. But in reality, there are simple things you can do to customize the look and feel of your site without risking disaster. This tutorial from WooThemesexplores how to customize WordPress to suit your needs. How to Set Up a Free Mini-Course in WordPress. Offering a free mini-course is a good way to give value to your website visitors as you build your email list. This tutorial shows you how to set up a free mini-course, and then it shows you how to put your mini-course behind a pay wall where the cost is the visitor’s email address. How To Speed Up Your WordPress Website. Users expect websites to be lightening fast. Improving your website’s loading time may improve your revenues. This tutorial offers 12 quick fixes that will dramatically improve your website’s loading time. The Definitive Guide to WordPress Security. 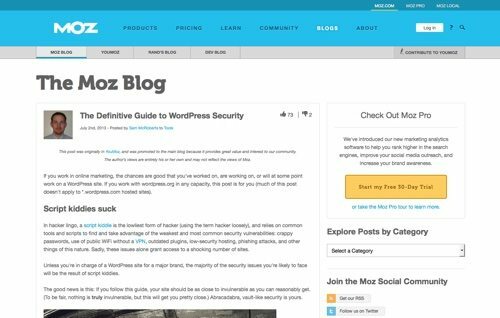 This tutorial on Moz is a guide to WordPress security. It covers hosting and server-level security, WordPress installation, personal security, and a seven-step checklist to maintain constant vigilance for your WordPress sites. The Definitive Guide To Higher Rankings For WordPress Sites. Optimizing your website to the best practices outlined in this tutorial will help you improve your rankings, increase your audience, and have a better website in general. Writing Your First WordPress Plugins, Basic to Advanced. This seven-part series from Pippin’s Plugins teaches you how to write your first WordPress plugin. It walks you through how plugins work, how to write them, and how to structure your plugin development. Pippin Williamson developed Easy Digital Downloads, an ecommerce plugin for WordPress that focuses purely on digital downloads. WordPress Multisite Guide for Beginners. Multisite is a feature within WordPress that allows you to run a number of sites from one WordPress installation. This tutorial explores multisite advantages and disadvantages, as well as examples, available plugins, multisite installation, and help to determine if a multisite is right for you. 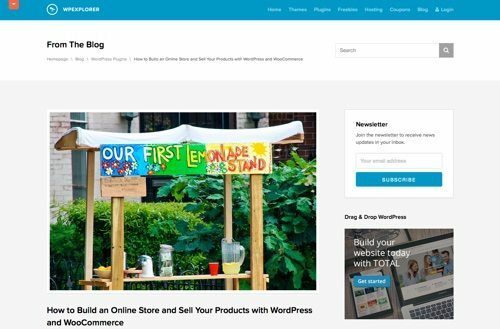 How to Build an Online Store and Sell Your Products with WordPress and WooCommerce. This tutorial explores the WooCommerce ecommerce plugin by WooThemes. It includes an overview, installation steps, tips on basic configuration, and shows you how to add products. Integrating Stripe.com with WordPress. This is a nine-part series primarily for developers on integrating the Stripe payment processor with WordPress. The series walks you through how to integrate payment forms, payment tracking, setting up recurring payment profiles, and more — with the Stripe API. The WordPress Community Offers Advice To Beginners. This article from Smashing Magazineoffers advice from the WordPress community to new users. The collection of insights comes from developers, designers, support reps, security experts, hosting companies, theme shops, and plugin developers. How to Setup a WordPress eCommerce Site. This is a basic tutorial on how to set up a WordPress ecommerce site. It reviews popular ecommerce plugins and online store themes for WordPress. These options allow you to launch an online store, quickly and easily, with minimal expense. 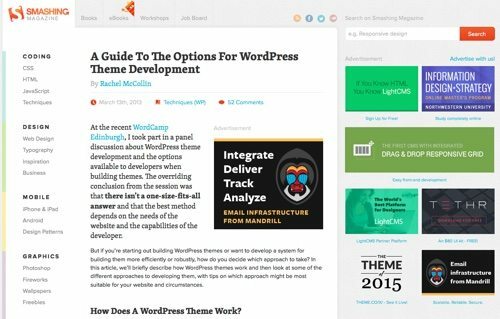 A Guide To The Options For WordPress Theme Development. If you’re interested in customizing a WordPress theme, here is a tutorial on WordPress theme development. It describes how WordPress themes work and then looks at some of the different approaches to developing them, with tips on which approach might be most suitable for your website. WordPress 101 Tutorials. If you prefer to learn by watching videos, this series of video tutorials by iThemes Media could be just the thing. It has 24 segments that cover everything you need to get started using WordPress. Create An Ecommerce WordPress Website In 3 Hours! This video tutorial by 77webstudio shows you how create a WordPress ecommerce website in under three hours. It uses WooThemes’ Wootique theme to build an online t-shirt shop. 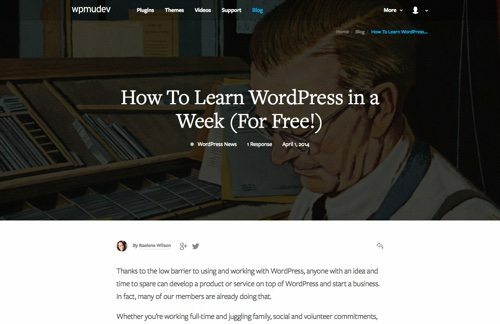 How To Learn WordPress in a Week (For Free!) 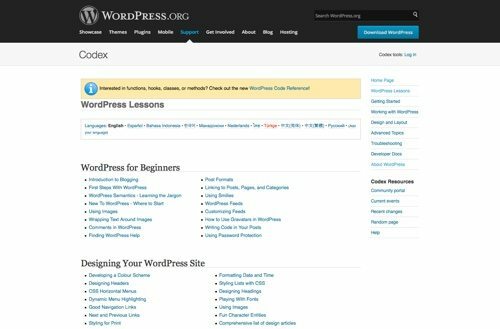 This post by WPMU DEV offers a step-by-step guide for users who want to become competent with WordPress in a week. It includes a plan for each day with plenty of additional resources. Even if you have a limited amount of time, mastering WordPress is within your reach.